Product and labour markets have strong links. Moreover, labour-management relations and negotiations are central to the functioning of labour market institutions, mostly in advanced economies. 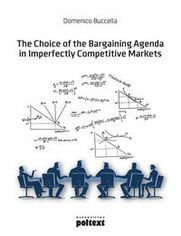 The monograph carries out an in-depth analysis of a fundamental aspect of unionised labour markets: the scope of bargaining (i.e. the issues which are the subject of bargaining between firms and unions), and the choice of the negotiation agenda. Those elements are crucial in unions-firms negotiations: in fact, both bargaining parties try to influence the agenda to enhance their respective positions in the determination of the wage outcomes. Domenico Buccella, Ph.D. – Assistant Professor at Kozminski University in Warsaw, Poland. His current research mainly focuses on industrial organization, collective bargaining, and in particular, the relations between product and labour markets.